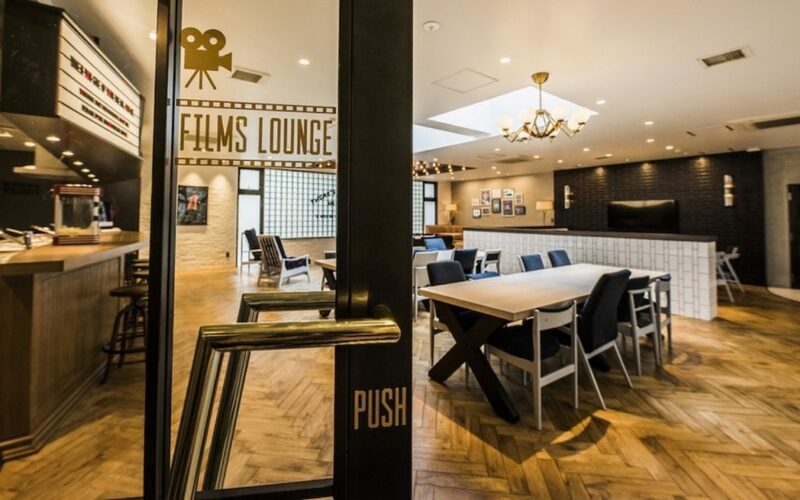 Walking into Films Wako doesn’t feel like a typical share house. 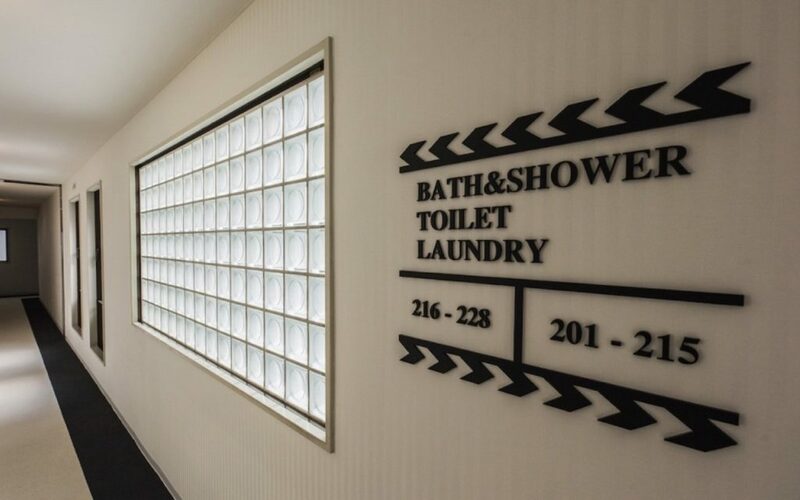 It’s more like stepping into a modern art deco-themed hotel lobby where plush black-and-white carpets, gold finishings and Edison lighting give it a Hollywood feel that’s as timeless as a classic movie — one that you could actually star in. 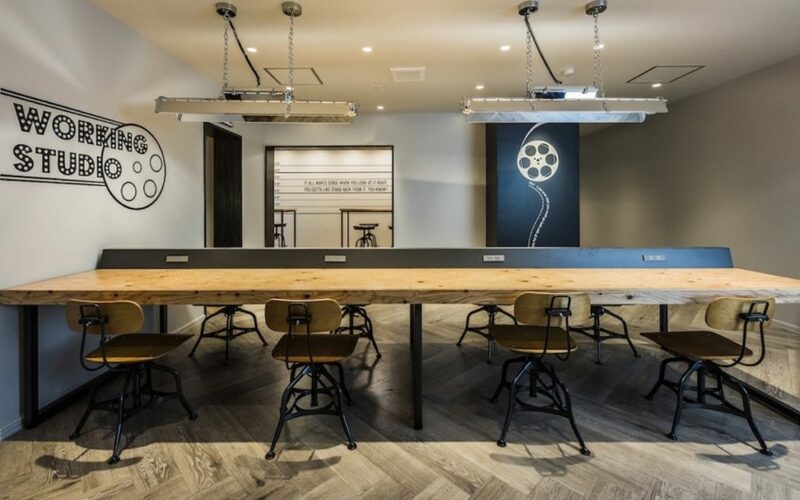 This is one of Social Apartment’s newest concept builds, based around every cinephile and Netflixer’s favorite pastime: Watching movies. Currently they have around 40 properties across Japan, and hope to double this figure; Films Wako is their most ambitious offering yet. I went to Wako-shi, the up-and-coming neighborhood in Saitama where the apartment is located, for a sneak peek during the pre-opening. Films Wako was designed with tenants working in the creative industries in mind, creating spaces that help facilitate those who work from home, are looking for like-minded collaborators or simply need a place where they can get inspired. 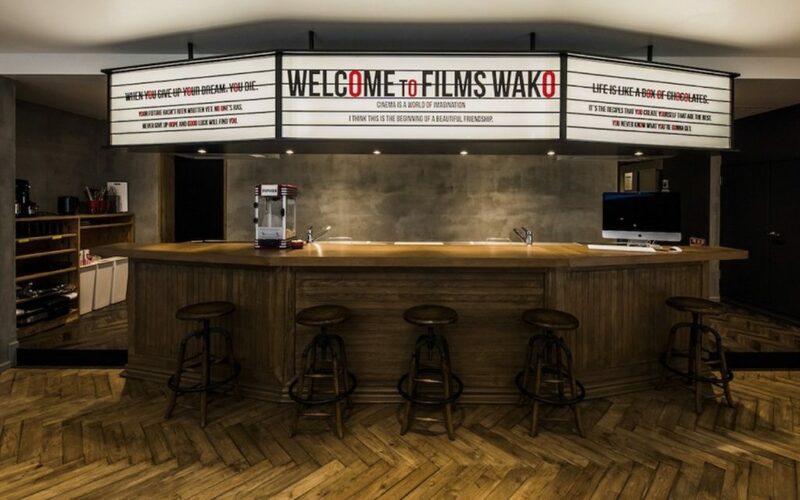 The creators of Films Wako have really gone above and beyond to produce outstanding facilities that not only foster interaction between housemates, but also help them pursue their creative professions and passions as individuals. 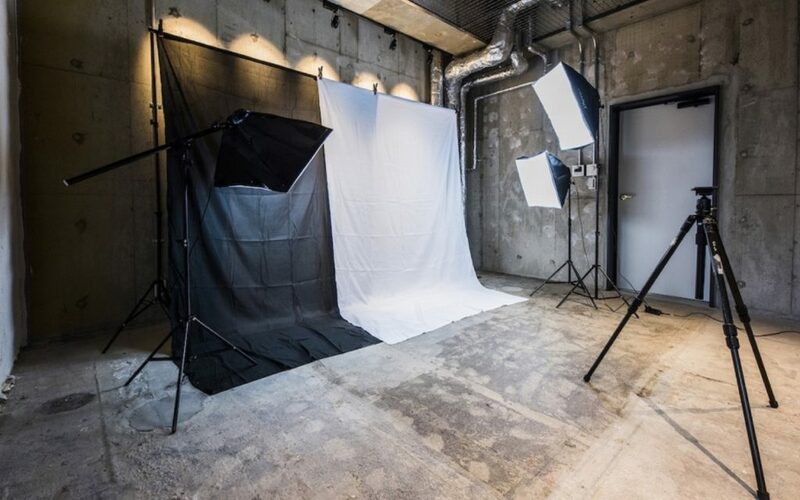 First there’s a photography studio complete with lighting, backdrops, and a green screen for any budding Youtubers, models or photographers that might want to take up residence. 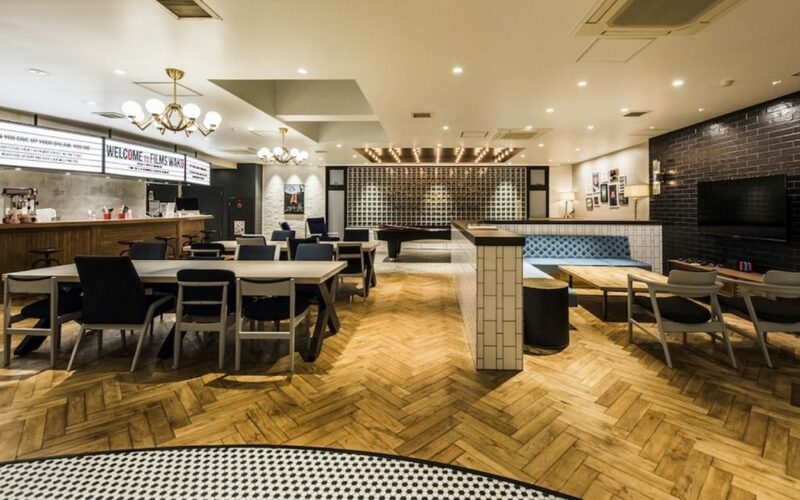 Next door, the spacious and modern working lounge provides a motivating alternative to outstaying your welcome in a cramped cafe with unreliable Wi-Fi. Additionally, for those health enthusiasts out there (of which I cannot claim to be, but good for you guys, honestly!) 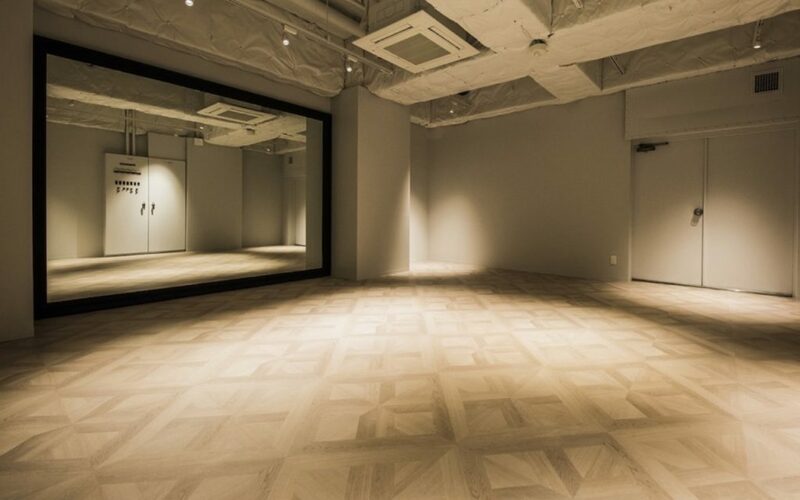 there’s a workout space with a huge mirror to check out your flawless pirouettes and perfect Bakasana poses. But the pièce de résistance of Films Wako, and completely encompassing the concept of this Social Apartment build, is the movie theater. 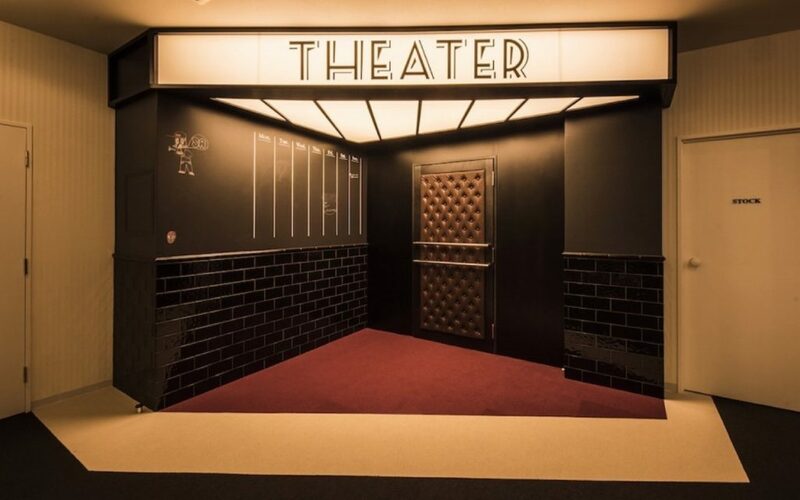 Enter through the plush soundproof door and you really are inside your own private cinema space — all 40 square meters of it. 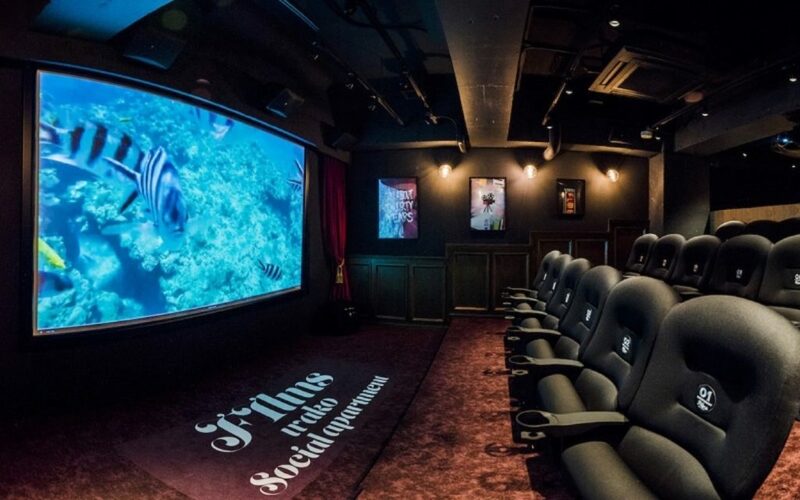 Equipped with a high tech 4K Epson projector, 7.1 surround sound system and a 150-inch screen, this actually feels like you’re at the movies — there’s even a popcorn machine at the back! The seating inside holds up to 20 people, 16 of which will have to janken for the sort of comfy leather seats you’d expect at an IMAX. With access to a 4K Apple TV, residents can simply turn up, connect their device and enjoy whatever they’re in the mood for, whether that’s binge-watching a series on Netflix or streaming their favorite Twitch gamer. Speaking of games, there’s also a PS4 Pro so you can super smash your bros in widescreen. 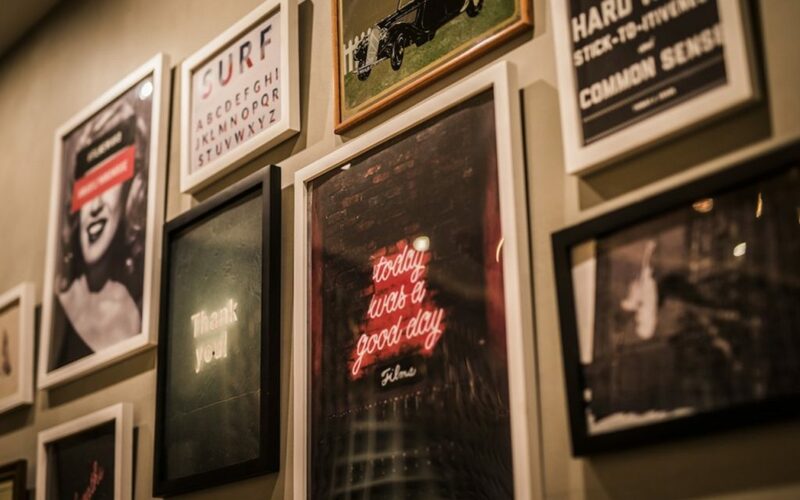 On the first floor, you’ll find the main lounge-kitchen-dining area decorated with all of your favorite classic movie quotes. The kitchen, modeled after a cinema ticket booth, has seven units and all amenities are included. Literally all you need to bring is your own fork — everything else is provided from Le Creuset cookware stocked on the shelves, to Balmuda toasters, and funky crockery that beats ¥100 store-bought any day. 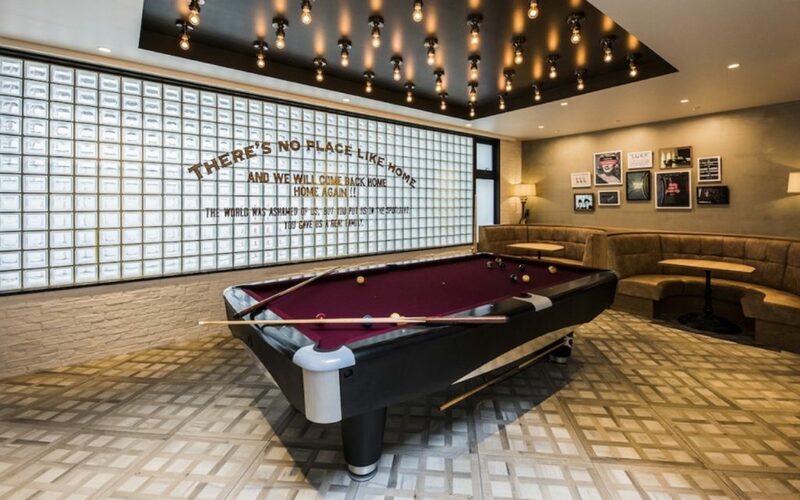 And while you’re waiting for the pan to boil, you can play billiards or challenge your housemate to a video game just next to the dining tables. The 123 bedrooms are each spacious in size with 3-meter high ceilings, a south-facing balcony and built-in wardrobes, creating a lovely private oasis to call your own. Furnished rooms come with a fridge, curtains, an air-conditioner (very necessary), bed, desk, chair and lamp, while the unfurnished rooms have an air-conditioning unit and the built-in wardrobe only. The modern washroom facilities are shared but separated by female and male. No worries though, you’ll never have to clean the toilet as Films Wako has its own crew of awesome cleaners, who also take care of all of the common areas, too. Another bonus of living at Films Wako? Guests are allowed to stay over – hooray for all those ready to flee strict women or men-only house shares, or ungenerous housemates. Now you’re friends and family will have a place to stay, and watch movies/play pool/get creative in the photo studio/workout/cook with nice equipment and meet cool people, too. Location wise, Films Wako is just a nine-minute walk from Wakoshi Station. From there, it’s connected by the Fukutoshin, Yurakucho and Tobu Tojo lines meaning that you can get to Ikebukuro in 13 mins and Shibuya in 24 mins, or head directly to Motomachi Chukagai, Yokohama in 1 hour 13 mins. If you do decide to move into Films Wako, you’ll be heavily discounted for your initial and monthly costs if you sign up for a 1 or 2-year contract. If that’s not right for you then the minimum stay is three months and you can do a rolling contract with that option. 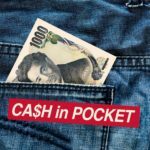 Monthly rent including utilities, insurance, and amenities will cost between ¥79,300 – ¥86,300. Another added bonus is that Social Apartments don’t charge the dreaded key money. 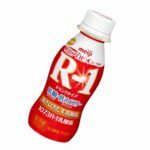 You can apply online with a copy of your passport and residence card or Certificate of Eligibility, an emergency contact in Japan, and a recent photograph of yourself. The Social Apartment team works with a guarantor company (who may contact you if they need any further information) but once the application is accepted and move-in payments are settled, you could be collecting your keys in as little as 7-10 days from the start of the application process. In the end, the standout best thing about Films Wako? 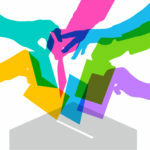 The community. 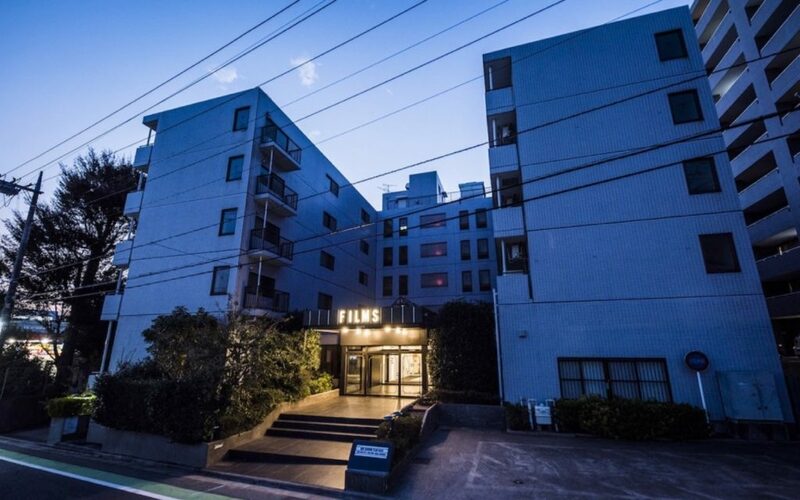 With about 80% Japanese tenants, living at Films Wako gives you a true opportunity to mix with locals. There is no better way to understand the Japanese culture and perspective than to live with Japanese people. All of the cool communal spaces mean you’ll have no choice but to make friends. 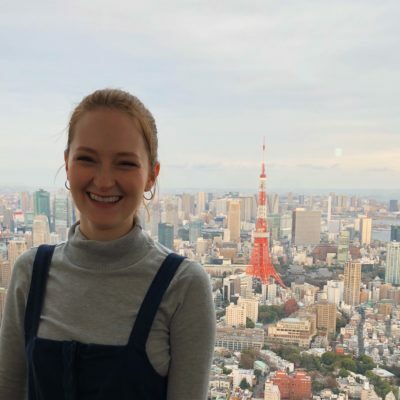 Both Japanese and foreign residents of Japan from various walks of life are learning new things from each other every day, and with the strong relationships they forge who knows what opportunities might come up — life is like a box of chocolates, right? You can check out a trailer for Films Wako below. 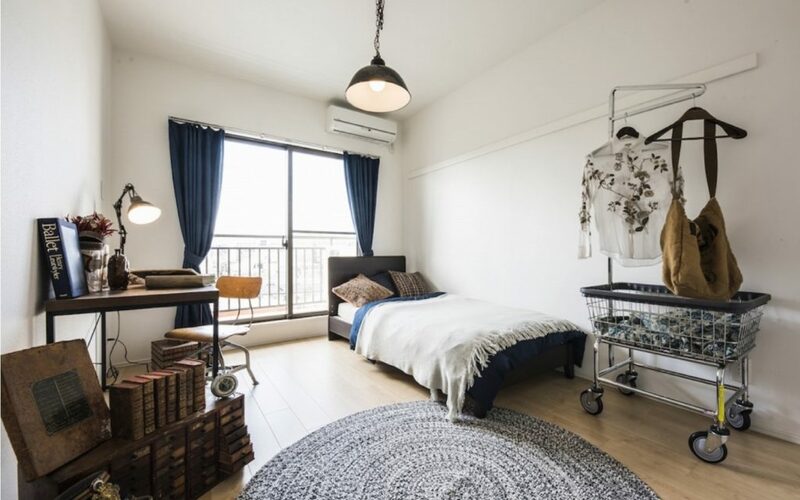 For more on Social Apartment, have a look at their other properties we’ve featured in Kiyosumi Shirakawa (Tokyo) and Takatsuki (Osaka).